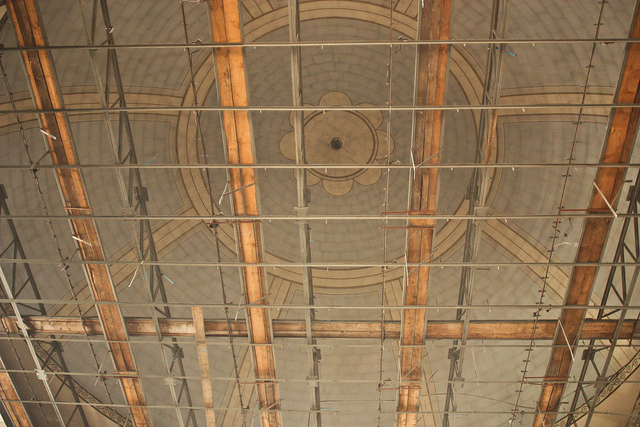 What Was Inside 19th-Century American Synagogues? 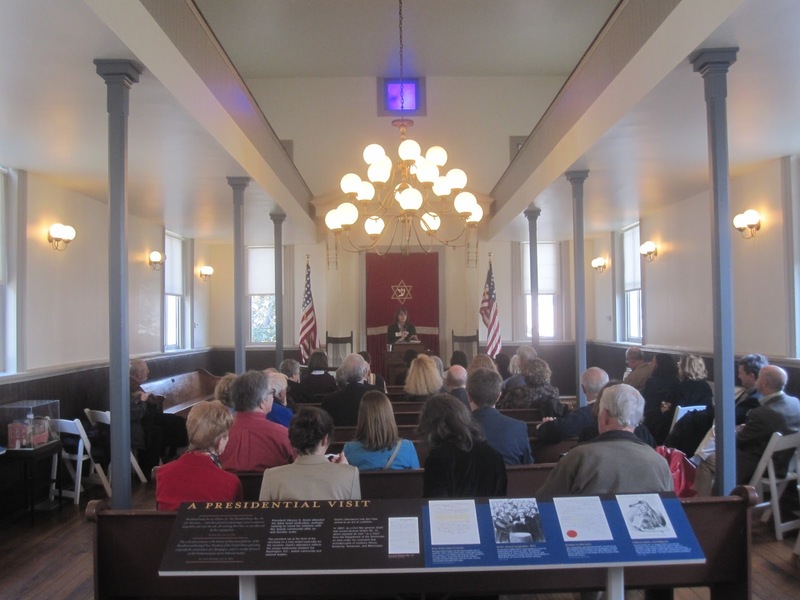 I'm working on a project with the Jewish Historical Society of Greater Washington (JHSGW), preparing an Historic Furnishings Report to describe more closely the appearance of the original Congregation Adas Israel synagogue, inaugurated on June 10, 1876 (with President Grant and Vice President Ferry in attendance). A decade ago I participated in the preparation of the Historic Structures Report for the building. We are confident about the main structural and architectural features of the former synagogue, but can never be certain about what was inside and how it as arranged - and things changed. This has led me back to the recognition of a broader lack of information about 19th-century American synagogue interiors. With a few notable exceptions, most of these buildings have not been written about in much detail, and when they are described the most attention is focused on their external style (Classical, Gothic, Moorish, etc.). 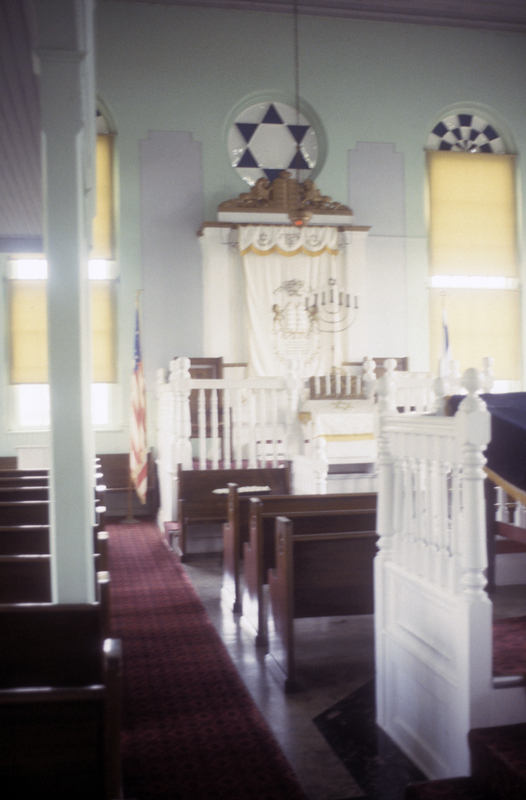 The best overall account of 19th-century synagogues remains the first chapters of Rachel Wischnitzer's book Synagogue Architecture in the United States. published in 1955 - more than a half century ago. But Wischnitzer did not focus much on issues such as the types and arrangement of benches and other seating (and their relation to interior processional routes); the placement of functional, symbolic and ritual lighting; the decoration of windows and wall surfaces; and many more seemingly mundane but everyday arrangements that help define what the life of the synagogue (in addition to its architecture) really is. New York, NY. Congregation Shearith Israel, 19th St. Bldg (1860), interior view showing procession with Torah scrolls at building dedication. The Sephardi seating arrangement - with a large open space between Ark and Bimah - makes processions easy. Less so, the arrangements in Ashkenazi synagogues. The placement of benches and location of aisles usually relates to liturgical practice as well as issues of comfort, space and public presentation. Photo: from M. Angel, Remnant of Israel, originally published in Frank Leslie's Illustrated Newspaper (Sept. 29, 1860). We can do much more than that. 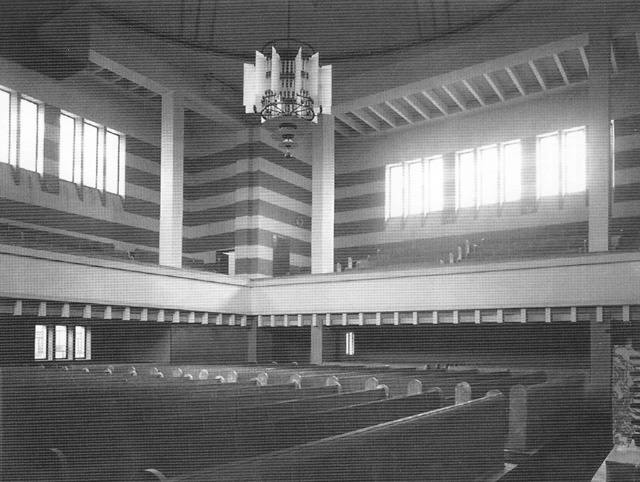 I'm asking for help in identifying further source material to help better describe the interiors of 19th and early 20th-century American synagogues. As you will read - these can include contemporary photos and drawings, newspaper and newsletter accounts, congregation minutes, congregant memoirs and other recollections. Over the years I have collected a lot of this material for my own use - but now I would like to be more systematic in this compilation, and to use some scholarly "crowd sourcing" to help. 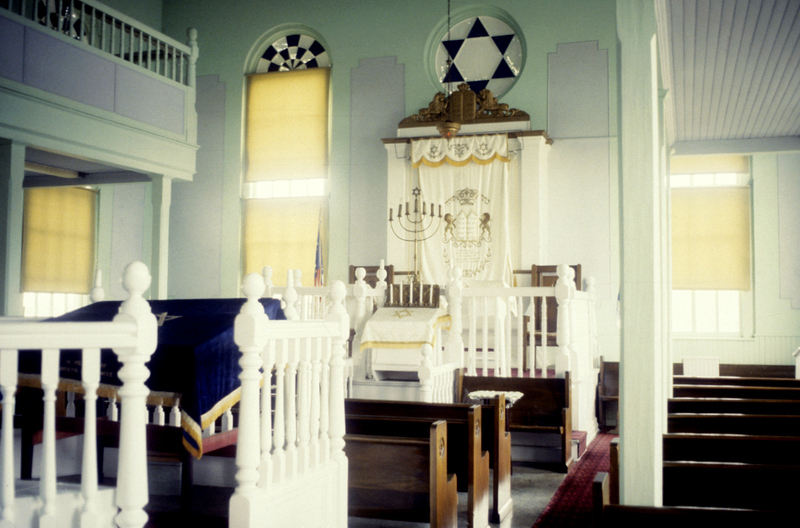 In the past twenty years historic preservation efforts, including many detailed architectural and material studies and research for the preparation of National Register of Historic Places nominations have amassed a large quantity of new informaiton on 19th and early 20th-century American synagogues. Local historical and genealogical societies have expanded and organized picture collections. But most of this material remains to be collated for comparative and historical study. Charleston, SC. Brith Shalom Cong., interior (1874). Installation of Rabbi Gilbert Klaperman in 1948. At the former Adas Israel, much remains uncertain about the furnishings (except the benches); color scheme; lighting and other fittings; as well as ritual items. We have a poor (but still very useful) newspaper photo (above) from 1903 and some non-specific descriptions in newspaper accounts of the dedication. 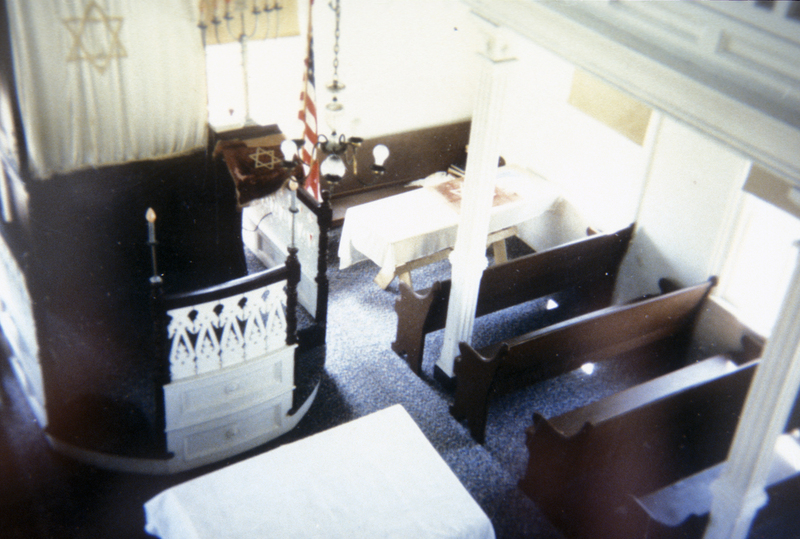 Surviving congregational minutes are not very helpful, and except for three original benches, original furnishings and ritual items from this first Adas Israel synagogue have not yet been identified. So we need to turn to comparative material, like some of the images shown here, that record near-contemporary synagogues of traditional/Orthodox congregations. Alliance, New Jersey. 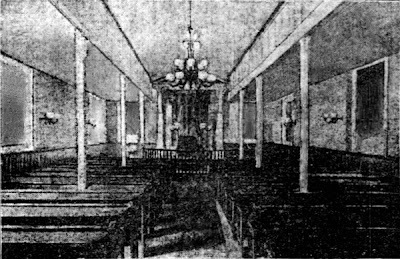 Tiphereth Israel Synagogue, 1889. Photo: S Gruber 1987. Alliance, New Jersey. 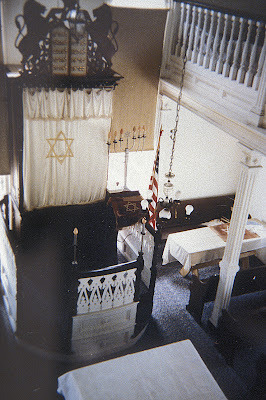 Tiphereth Israel Synagogue. Women's gallery, 1889. Photo: S Gruber 1987. Woodbine, New Jersey. Agudas Achim Anshei Cong. (Brotherhood Synagogue). Women's gallery, 1896. Photo: S Gruber 1987. Woodbine, New Jersey. Agudas Achim Anshei Cong. (Brotherhood Synagogue), 1896. Photo: S Gruber 1987. Overall, with the exception of a few notable buildings (such as Temple Emanuel, Shearith Israel - both demolished - and Central Synagogue in New York, Mikveh Israel in Philadelphia (demolished), and a small number of others) the specific documentary evidence for 19th-century synagogue interiors is remarkably sparse. Most synagogue interiors were never photographed - or the photos do not survive. Those shown here are the exception, not the rule. This was especially true of small synagogues, and those built before the 1920s. 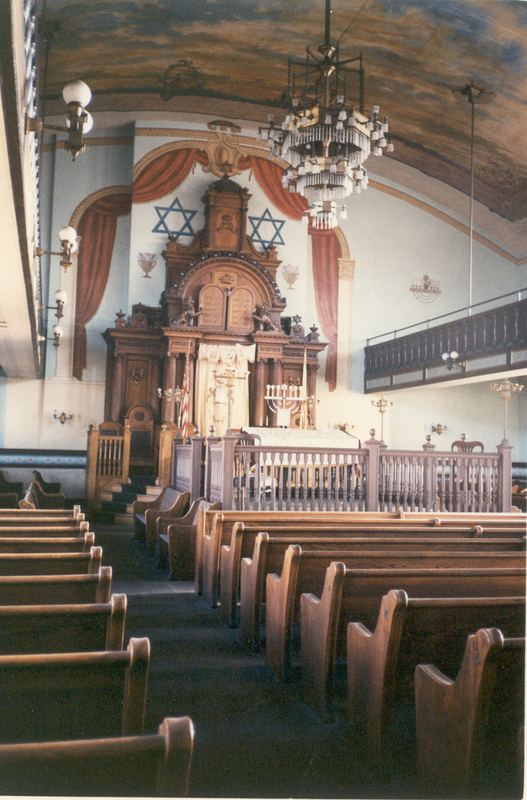 For the synagogues of turn-of-the-century East European Jewish immigrants there are only dozens of known interior views of the hundreds of congregations and chevras that struggled or flourished, but then were gone. Successful congregations usually moved on to newer buildings and neighborhoods. Unsuccessful congregations just closed their doors. Sometimes richer congregations sold to poorer ones - and in these cases when the older buildings have survived or survived longer, more information can be gleaned . After 1920, interiors of Reform and some Conservative synagogues were photographed more than Orthodox shuls (it was customary to have photos on the bimah for graduation confirmation classes in Reform Temples) - but even these views often only include close-up views of the Ark area. Contemporary descriptions are hard to come by and need to be pieced together from newspaper accounts in the mainstream local press (often written by non-Jews unfamiliar with specific Jewish items and usage, and often describing a formal occasion; not the everyday appearance) and some in the Jewish press. Most of these have not been indexed (or digitized) and we are lucky when they have been discovered and published by local historians. Four major Jewish newspapers now appear to be available online through ProQuest - for those libraries that can afford the service. Some congregations or historical societies do maintain building committee minutes, but these are often very laconic or incomprehensible, and even at best describe items by cost not by appearance. We rely on all these sources for comparative material as well as investigations of small number of still extant synagogues (Baltimore, Phila. Southern New Jersey, North Carolina, etc) and of synagogal ritual items now in congregational or public museums. For many of the non-liturgical or non-symbolic items we also can look at contemporary church, public building and even domestic interior furnishings and decoration for similar items (benches, lights, chairs, carpets, window shades, balcony rails, etc. etc.). Chelsea, Massachusetts. Walnut Street Shul, 1909. Photo: Samuel Gruber 1990s. I am hardly the only one interested in synagogue interiors - and they are being investigated in many ways. These include complete full scale restorations as at the Eldridge Street Synagogue and Kehila Kedosha Janina in New York, both of which I have written about in the past, and digital reconstruction of past appearance as for the former Baltimore Hebrew Congregation / Lloyd Street Synagogue, now part of the Jewish Museum of Maryland. In Indiana, for instance, check out Wendy Fergusson's blog about her efforts in Lignonier at the 1889 Ahavas Sholom Synagogue (more on this later). Expect to see me posting more in the coming months on synagogue interiors - and some of the problems in understanding what these spaces looked like - and exactly how they were used and understood. The American Sephardi Federation (ASF) has published and English edition of Elias V. Messinas' study The Synagogues of Greece: A Study of Synagogues in Macedonia and Thrace (ISBN 978-0-8197-0789-5) based on his 1999 doctoral dissertation and subsequent work on documentation and protection of Jewish heritage sites in Greece. The book provides two main themes. First, it is detailed history of the the synagogues of northern Greece (Macedonia and Thrace), mostly a legacy of the Ottoman period. Messinas has dug deep to collect information on all identifiable synagogues, some known only by name. He traces the history of these institutions and structures and places them in their urban context from the 15th through the 20th centuries - so there is much of value here for student's of Jewish settlement and Jewish quarters. Almost all of these buildings are gone. Many were destroyed in the great fire that swept Salonika in 1917. Those that were rebuilt were destroyed in the Holocaust or in the years following, when the once large Jewish communities of Northern Greece were reduced to tiny numbers. In the 1990s, Messinas was able to document several extant synagogues - albeit surviving in ruined condition - and document them with measured drawings and photos before they were demolished. Messinas was an almost lone voice protesting the demolition of the synagogues of Komitini and Didmoticho, by the Athens- based Greek Jewish community. He also spear-headed the first phase of restoration of the historic synagogue of Verioia about which he wrote in his first book The Synagogues of Salonika and Veroia , Gavrielides Editions, Athens, Greece (ISBN 960-336-010-4) 158 pages (1997, reprint 2000). Some of the earlier material about Veroia and Salonika also appears in this new volume. The second theme of the book justifies the title The Synagogues of Greece, since it consists of a valuable portfolio of measured drawings - plans, elevations and section - of synagogues from all of the country, including the Peloponnese and the Islands. This section is a valuable comparative tool for understanding a modern country's Jewish architectural heritage. Still, this heritage has to be seen in larger context - some of which Messinas described in his text. 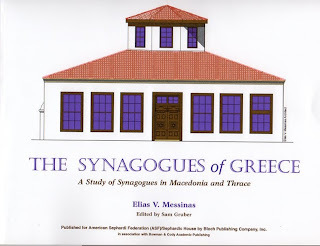 Depending on where they are/were located, Greek synagogues are tied to either Italian or Ottoman traditions, on in some cases to a more ancient Byzantine-Romaniote art and liturgy. Unfortunately, it is still a struggle in Greece to have Greek-Jewish heritage seen as Greek heritage. The recent designation of the Jewish cemetery of Ioannina as a protected landmark is a good sign. Recent published books about synagogues in Turkey and Bulgaria, mostly carried out since Messinas finished much of his research, now allow us to create a well-documented visual (if not an historical) compendium of synagogue architecture of the Ottoman Balkans and Anatolia (related, but somewhat different traditions can be seen in Syria, Egypt and across North Africa). Many of these photos can be seen in the online archive of the ASF. I also look forward to future scholars using the new Messinas book in comparative studies of Moroccan and other Sephardi diaspora cultures to trace the legacy of Spanish Jewish culture in later architecture. This book does not replace the still essential guide and reference by Nikos Stavroulakis and Timothy J. DeVinney, Jewish Sites & Synagogues of Greece (Talos Press, 1992). The two books are very different and complement each other. The Stavroulakis book especially can be used with Messinas's drawings. The American Sephardi Federation and Sephardi House have done a service in making this text - previously only online in Greek - available to a wider English speaking audience. It is published as part of a series on the Holocaust in Greece edited by Prof. Steven Bowman. Indeed, the documentation of this lost culture does bear witness to the destruction of the Holocaust. But the study is much more than that - as it testifies to the long and deep Jewish roots in modern Greece and to the architectural heritage of Jewish communities which were part of an international culture. I first met Elias twenty years ago when he was a graduate student just starting this quest. I was glad to encoruage him at the time and I was happy to provide some modest effort to make this book possible. Elias is now a successful practicing architect, specializing in "Green" design. He has left his studies of Greek synagogues behind, but this book (and his previous book) allow that is research will remain available and useful to all in the future. Julian H. Preisler, historian of Jewish West Virginia, refers us to an article in the Parkersburg News and Sentinel (March 16, 2013) that reports that Temple B'nai Israel in Parkersburg will soon sell its building. The congregation, founded in 1909, has become to small to maintain the small Temple, which was built in 1949 in a modern style with roots in pre-War Art Deco and Art Moderne design. For a picture click here. According to the article, Robert Beau Ellison, treasurer of B'nai Israel, said the building will be listed for sale this spring. "We are down to just a very limited number of Jewish families in town who are members of the temple," ...It's not as much a cost issue as it is a people issue. In order to maintain the building and keep everything going, you have to have enough people to do things. We just have limited people to draw from." The situation at Parkersburg is a familiar one throughout smaller communities, especially in the South and mid-West. According to the Temple website "As of 2011, there were 15+ families who were affiliated with the Temple compared to 170 in the 1970's. While there are other Jews in the area, they have not joined this Temple community. The future of the Temple building is in question because of the lack of funds to maintain it. Discussion with the Jewish Legacy Project has begun about what to do when the last member of the Temple leaves the area. Alternative meeting sites are being reviewed. The heritage and history of this community will be preserved. 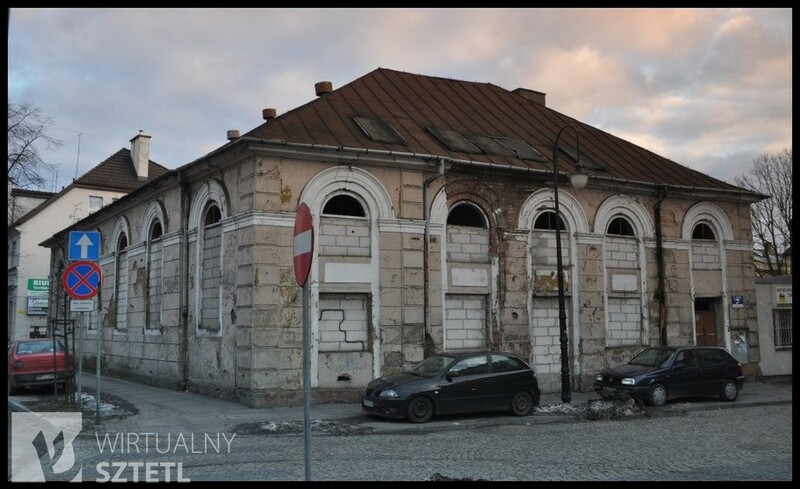 Slovakia: Update on Zilina Synagogue Restoration - You Can Help! 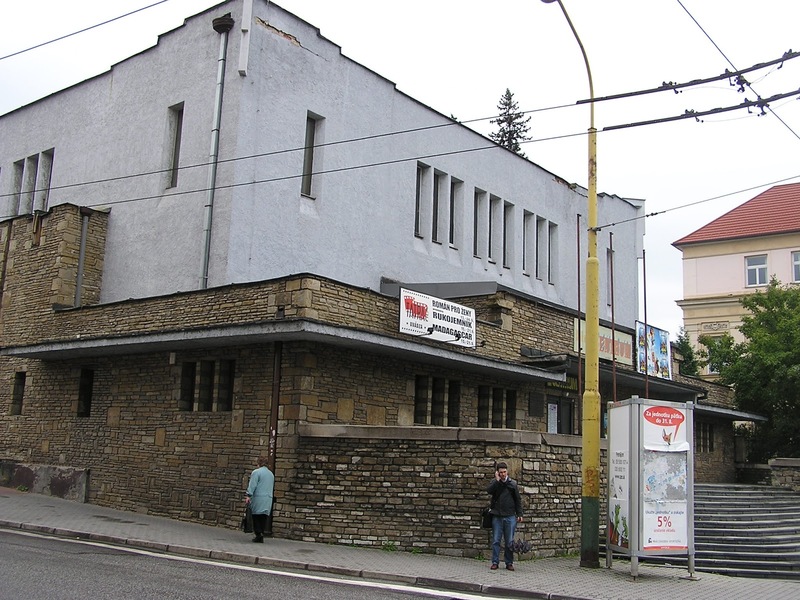 Jewish Heritage Europe reports on the progress for the restoration of the important modernist synagogue at Zilina, designed by German architect Peter Behrens. I wrote about this effort at length when the Jewish Community of Zilina first turned its thoughts to building restoration in 2009. At that time the Jewish Community had regained ownership of the building, which has been used for many years as a cinema and lecture hall, but was uncertain how to proceed with restoration - especially since funds were not available for the work, but meanwhile the building as it stood could provide a modest - but real - revenue stream. In 2009, I wrote : "the best hope for the Behren's synagogue is to reach outside the normal (Jewish) funding circles and to involve groups dedicated to protecting and preserving the legacy of modernism." This is exactly what has happened (without any involvement by me. Zilina, Slovakia. Synagogue as it appeared when built. In 2011, the Jewish community arranged to lease the building for a symbolic sum to a group of architects and cultural activists of the NGO Truc sphérique which would oversee the restoration of the building and develop it as a cultural center focusing on contemporary art. 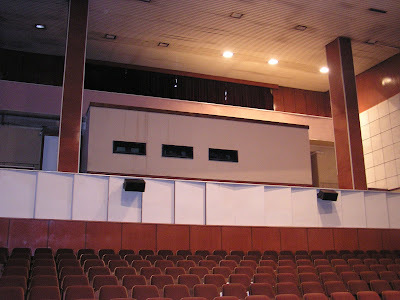 Similar solutions have been used in other former synagogues in Slovakia, especially at Samorin and Trencin, both of which function as art centers. Neither of those projects, however, is as ambitious as at Zilina where plans are to return the modernist icon back to its original form. The chief architect for the project is Martin Jančok. The total costs for the project are estimated a €1 million - one of the reasons the Jewish Community was reluctant to take on this task. The organizers have already raised and spent €100,000 in the first phases of work. Much of this has been raised online through social media and new fund-raising strategies. This type of work shows that restoration projects - even when locally-based - can find a much larger audience of support. The fact that the project combines constituencies engaged in Jewish history, modern architecture and contemporary art is a big advantage as that swells the project audience and donor base and also reaches across nation, religious and generational lines. Truc sphérique is an artists' cooperative and has relied on volunteer labor for much of the work and has received in-kind contributions from local businesses to move the project forward. Truc sphérique is non-governmental organization for contemporary arts and culture founded in 1998 in Zilina, and it has operated the building of Stanica since 2003 where it runs a gallery, workshop space, residency space for artists, cafe, waiting-room, and a multifunctional presentation venue for theater, dance, concerts, discussions and screenings. Stanica is member of various European networks, especially Trans Europe Halles. Zilina, Slovakia. Domed ceiling revealed in restoration. Photo: Natália Zajačiková 2012. (n.b. this essay was written in 2009 and not published. At the end I add a postscript about an excellent new article on the subject by Diana Muir Appelbaum). Passover is coming, and as in each year, we celebrate the liberation of the Israelites from slavery in the Land of Egypt, where according Exodus 1:11: “they appointed taskmasters …to afflict them with hard labor. And they built for Pharaoh storage cities, Pithom and Raamses.” This brief mention of Israelite construction work is the first reference in the Bible to any Jewish architecture – and it was for buildings erected under duress (Noah and his Ark don’t count, he wasn’t Jewish). Still to come would be the triumphant accounts of the Divine-inspired and ritually circumscribed creation of the Desert Tabernacle (Mishkhan), and still later of the Jerusalem Temple. But in Egypt, architecture was a tool of oppression, not to redemption. One would think then, that once across the Red Sea, Jews would put Egyptian architecture behind them, and leave it to memory – just a tiny facet of the greater story we are commanded to remember. And so it was for most of Jewish history, until the strange case of the 19th century, when in the wake of widespread European emancipation of Jews from Ghetto life and second class citizenry, the Egyptian style of architecture was taken up worldwide as an appropriate design for synagogues. Today, when it seems that almost every congregation building anew wants their architect to supply a wall of Jerusalem limestone this link to Egypt is unthinkable, and almost forgotten – one of the many aberrations of the 19th century when Jews were groping in the dustbin of history to help fashion a new identity. Of the many Egyptian style synagogues only a few survive, and these are in Copenhagen (Denmark) and Riga (Latvia), hardly centers of modern Jewish taste-making. In the early 19th century things were different. In the wake of Napoleon’s expedition to the Nile in 1798, Egyptomania took hold in France and from there influenced almost every aspect of modern European (and by extension, American) culture. French savants documented Egyptian art, architecture, topography, botany, geology and every other aspects of life and land along the Nile and though French rule in Egypt was very short, the influence of French research and the eventual publication of the massive 21-volume Description d’Egypte… beginning in 1809, was tremendous; one of the major cultural events of the Early Modern era. Artists, architects and writers all embraced Egyptian themes, though ironically the vogue for Egypt was already dying out in France when the books began to be published. In architecture the massive grandeur of Egyptian forms, mixed with the inherent or implied mystical meaning of the decorations, were adapted to a wide range of building types. Freemasonry, which in this period reached the height of its popularity and power, incorporated many Egyptian elements into its ritual and symbolic language (that’s why we have the picture of the Pyramid on our dollar bill). Because of the excitement surrounding the discoveries of Egyptian tombs, the Egyptian style was particular popular for funerary art. It was Napoleon who just a few years earlier had extended the rights of citizens to the Jews of France, and would do the same for the Jews in the lands he subsequently conquered. The walls of Ghettos of Italy and Germany fell before Revolutionary forces, and the Jewish use of Egyptian motifs began in Germany about the same time. The first known use of Egyptian design elements in a modern Jewish building is the synagogue of Karlsruhe Germany from 1798, the year Napoleon was in Egypt. It’s not sure what sources the architect Friedrich Weinbrenner (1766-1826) used, but Napoleon was not the first to visit Egypt, and in Vienna in the same year Mozart had freely interpreted some Egyptian motifs in his staging of The Magic Flute. Weinbrunner designed the entire city of Karlsruhe, and the scenographic treatment of the approach to the synagogue through a tall gateway flanked with Egyptian pylons was part of the larger effort to give the city scenic focal points. But other synagogues, including the new Reform synagogue in Frankfurt am Main, and a small synagogue in Efringen-Kirchen (1831) had Egyptian influenced pylon entrances perhaps related to Karlsuhe. Another attempt at creating an Egyptian style synagogue – which better demonstrates one way in which the style was imposed upon Jews in Germany - took place in Kassel, Germany, where Jews had received equal rights in 1807 after the city’s inclusion in the Napoleonic Kingdom of Westphalia, but where no decision was made to build a new synagogue until 1828, after the old synagogue was closed as being unsafe. In Kassel, the landgrave who provided the site for the new building, wanted something unusual, and various Egyptian designs were presented. But this time, the Jewish community and its favored architects – Auguste Schuchardt, and his young associate, A. Rosengarten, the first and most successful Jewish architect of the 19th century, objected to the theme, citing its incompatibility with Jewish history. The architects and the Jews held their ground, and eventually in 1836-39 an impressive new synagogue was built in the most widely used historic style of the time – a modified Romanesque. Rather than building a synagogue that recalled a time of slavery, and would have singled out Kassel’s Jews as exotic; the Jews of Kassel succeeded in celebrating freedom – by having architecture the fit in. Philadelphia, PA. Congregation Mikveh Israel, Cherry Street. William Strickland, arch. 1824-25. There seemed to have been no objections voiced by Jewish patrons in America, however, where the Egyptian style was popular among the young republic’s leading architects in the 1820s and following. 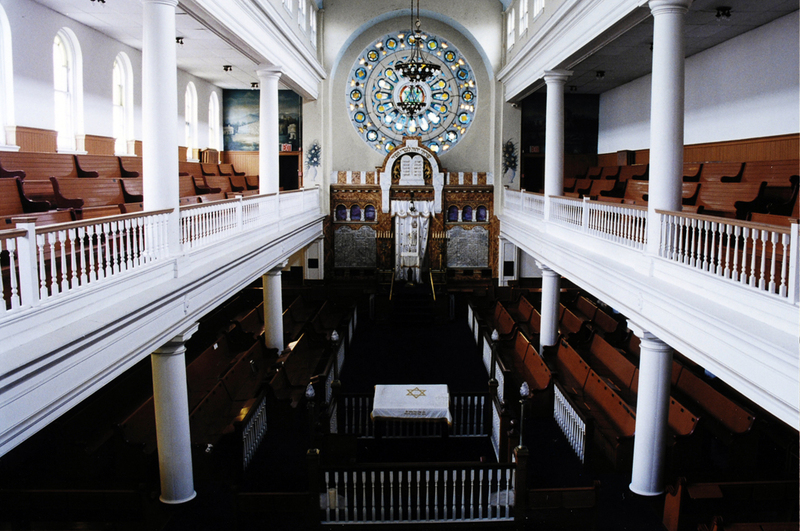 The established Sephardi congregations were in the habit of choosing prominent architects, and in Philadelphia William Stickland was commissioned to design the second building for Congregation Mikveh Israel. 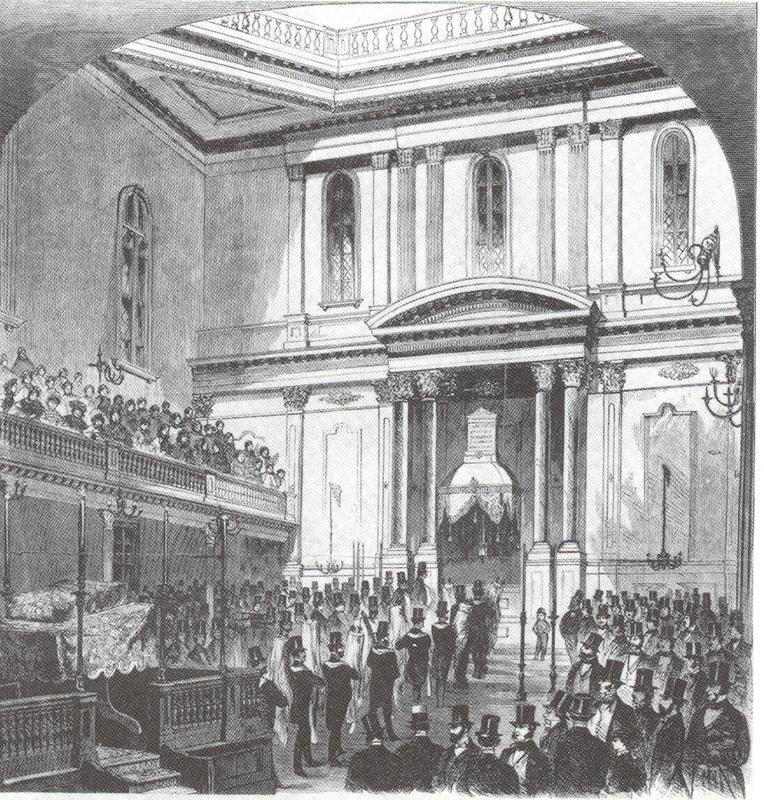 Despite his widespread use of Greek classicism for public buildings such as the Second Bank of the United States, Strickland chose the Egyptian style for the façade and certain interior details of the synagogue, built in 1824-25. This was the first Egyptian style building erected in Philadelphia, one of the nation’s centers of architecture. A contemporary guidebook stated that the dome is supported with “Egyptian columns copied from the temple of Tentyra…” And an engraving shows the sign of the winged sun placed over the Ark. Of course, the ancient Egyptians did not use domes, and the overall effect of the sanctuary would have been more English in style than Egyptian. In choosing the Egyptian style, was Strickland merely being fashionable, or for Philadelphia even avant-garde? Or was he seeing the Jews, like the Egyptians as a distant and mysterious people, alien to the Greco-Roman tradition? Mikvah Israel also used the style for the entrance building to their cemetery built around 1845. 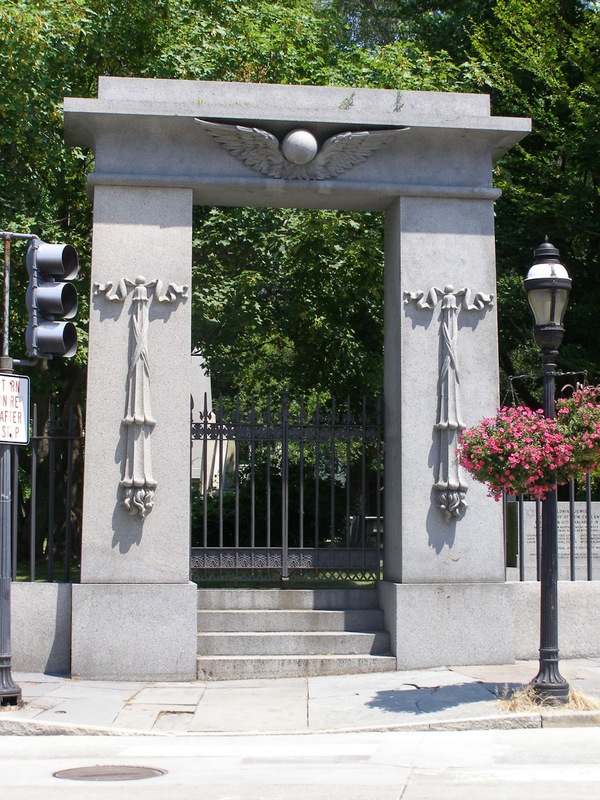 About the same time the Jews of Newport built an impressive Egyptian gateway to their cemetery, still a prominent landmark today (see photo above). The most impressive and fully realized example of the Egyptian style, and one that is still in use today, is Copenhagen’s Synagogue in Krystalgade, designed by G. F. Hetsch. From the very start, Hetsch, who had studied in Paris with Charles Percier, made his intention clear. When chosen by the Committee of the Jewish Community, he wrote in his presentation remarks of 1829 “I hope that the Synagogue …would be distinguished form other public buildings in the capital and easily be recognized by the character of Oriental origin which I have essayed to give the whole.” Percier had designed Egyptian style stage sets for a French version of the Magic Flute in 1801, and Hetsch was already sketching Egyptian architectural fantasies in 1811. But it was the publication of the French Description that provided the archaeologically correct details that Hetsch used in Copenhagen. 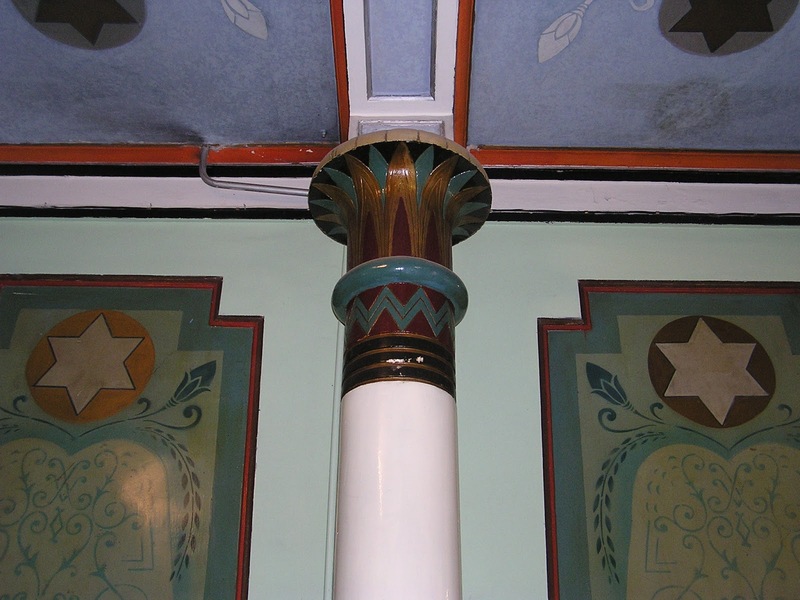 Similarly, Jean Baptiste Metivier used Egyptian style columns with palm leaf capitals in his 1826 synagogue in Munich. In the 1830s, the Egyptian style was used in American for prisons. By the 1840s, the style was more widespread and used prominent civic structures such as the Essex County Courthouse in Newark and the Medical College of Virginia, in Richmond. A quarter century after Strickland designed Mikveh Israel, his pupil Thomas U. Walter, who had designed the Debtor’s Prison in Philadelphia, used a heavy Egyptian style for the façade of Philadelphia’s Crown Street Synagogue. By this time the style was well known, but still it is remarkable that it was chosen by Walter (or his clients) considering the architect was already well known for is classically deigned Girard College, and he would go on to achieve face as the designer of the dome of the Capitol in Washington. (Walter had used the style for a design for the gate for Laurel Hill Cemetery submitted in 1836). Philadelphia, PA. Beth Israel Synagogue, Crown Street. Thomas U. Walter, arch. 1849. Photo: Richard Carrott, The Egyptian Revival, pl.91. The Egyptian style was popular across the globe. Examples were built as distant as Hobart and Launceston in Tasmania and in Sydney, Australia. But by the mid-19th century, interest in Egypt had faded, and now for those who favored exotic styles of architecture for the Jews new types of Oriental designs became manifest in the so-called Moorish style, influenced by Islamic decorative elements from Spain. There is one impressive late example of the Egyptian style to be seen in the synagogue of Riga, Latvia, (of which I have written on this blog before), where the archaeologically exact elements preferred in the 1830s have now merged with elements of Art Nouveau design. This essay was written in 2009. Last year Diana Muir Appelbaum published an excellent article "Jewish Identity and Egyptian Revival Architecture" in the Journal of Jewish Identities (July 2012, pp. 1-25) Diana explores - and clearly explains - many aspects of the style popularity and dissemination that I did not cover, or was not fully aware of. 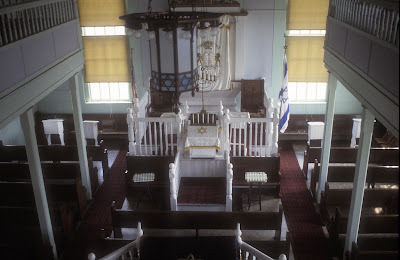 She details the origins of the style for synagogues in Scandinavia, and she emphasizes - rightly so, I think - the strong connection of the style to Freemasonry. Local patrons, Jewish leaders and synagogue architects were all deeply involved in Freemasonry as an intellectual, political and social movement in the early 19th century (and later). Despite the apparent incongruity, Diana suggests that the Egyptian motifs on synagogues actually related to the Jerusalem (and masonic) temple, since masonic teaching has Solomon's design influenced by Egyptian architecture, now so easy to identify through the French explorations and publications. She also places the Australian Egyptian synagogues squarely in the British Imperial orbit, linking them back to English Egyptian examples that had their ties to Freemasonry. Diana points the way to two very important areas of future research on synagogue architecture. One, obviously, is the much deeper tie between synagogue architecture and Masonry that extends far beyond the Egyptian style. 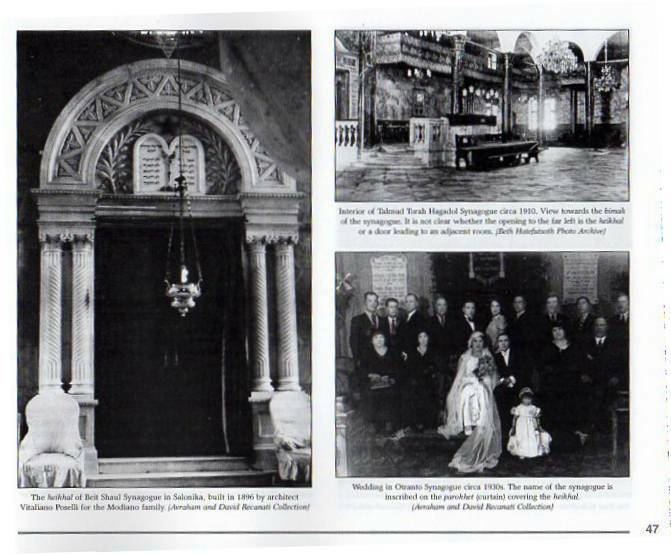 We know, for example that early American synagogues had their cornerstones laid with Masonic rites, and some of the first active Jewish architects in America - like Hyman Witcover (1871-1936) - were active Masons, and designers of Masonic Temples. Secondly, her work reminds up of the importance of imperial commercial, political and military routes aroused the globe in spreading Jews, and also news ideas to and for Jews. This is not unknown to scholars. There has been much work in recent years defining the "Atlantic World" of early modern Jewry - linking both sides of the Atlantic into one cultural, economic and even family matrix. We can look, too, at the spread of (mostly Sephardi) Jewish communities throughout South Asia and the Pacific, aided by the economic activity of leading commercial families such as the Ezras and the Sassoons, linked to British imperial interests. Płock, Poland. Small Synagogue before restoration,, Photo: K. Bielawski/Virtual Shtetl. Płock, Poland. Small Synagogue after restoration,, Photo: Virtual Shtetl. (ISJM) While Poland awaits the grand opening of Warsaw's long-anticipated multi-million euro Museum of the History of Polish Jews next month, the country also marks the opening of another Jewish museum in Płock. The former the 19th-century "Small (mala) Synagogue" of the central Polish town will open later this week, after a two-year renovation of a former Small Synagogue," as the Museum of Masovian Jews, a branch of the Museum of Płock Mazowiecki. This is not the restoration of the former synagogue, but the transformation of the building into a museum. The opening is scheduled for March 15th, 2013. I hope to visit the new museum when I am in Poland next month. The attractive classical style brick synagogue has been vacant and in ruined condition for years, but since it is one of few synagogues in the Mazowsze region to survive the Holocaust, and the only one in Płock, the need for its preservation has long been recognized. The Jewish presence in Płock is thought to date to around 1400, and in 1939 about a quarter of the town's population was Jewish - almost all of whom perished in the Holocaust. Approximately 10,000 Jews from Płock and the environs were contained in the Płock ghetto. In 1945 only about three hundred survived. The synagogue, known as a the "small synagogue," was built ca. 1810 originally also served as a school and offices of the Jewish community, and as a residence for the rabbi. In 1870, it was restored at which time a new Ark, was installed inside. The larger Great Synagogue was built in 1866 replacing an older "Great Synagogue." The newer building, a large domed eclectic-style building that incorporated classical and Moorish elements, was pillaged and burned in the Holocaust and the ruins were demolished in 1951. During the Second World War, the Small Synagogue building housed the Judenrat - the Jewish council that administered the ghetto. In 1959/1960, the building became the property of the State Treasury and was soon thereafter designed an protected historic monument, but neglected. In 1997 the property was returned to the Jewish community of Lodz, which then sold it back to the city, relinquished rights to the property in exchange for 224 thousand. zł. In 2004, after city planed to sell the building were withdrawn, the Stowarzyszenie Synagoga Płocka (Association of the Płock Synagogue) was formed and took the building over from the municipality with the intent of restoring the structure for cultural use. Initial support came from the Regional Operational Programme 2007-2013 Mazowiecki under the "Use of natural and cultural resources for tourism and recreation" provision. The Association signed a cooperation agreement with the Foundation for the Preservation of Jewish Heritage (FODZ). As part of the agreement, the Foundation has provided significant support to the project. The building structure from foundations to roof was strengthened, and a new roof was installed. The 19th-century interior was renovated for the museum. According to information on the museum website, the total cost of the project was over 9 million zł (more than 2,176,000 euro), of which 7.7 million zł came from the European Union. The museum’s highlight is the multimedia exhibition on Jewish history and culture. An exhibition on the Holocaust will be displayed separately. The exhibition will include paintings by Feliks Tuszyński, a ninety-one year old painter who was born into a Jewish family in Płock and has been living in Australia since 1950. Forty paintings have been donated by the artist himself. 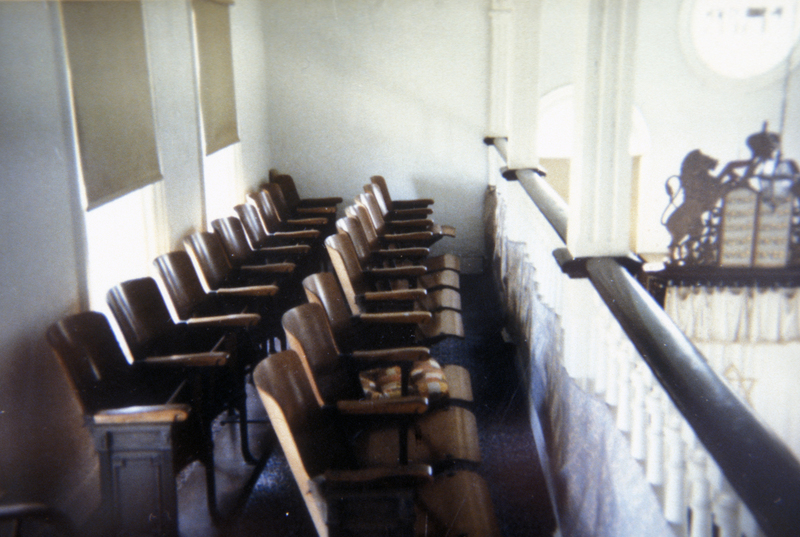 The building interior was redesigned to hold educational classes and concerts. Conference: "The Spatial Turn in Jewish Studies"
Over the past decade the term "Jewish Space" has become ubiquitous. But it takes on different meanings in different fields of study, and amongst different generations of scholars. But we can see across the field of Jewish Studies a greater appreciation of the role of space and place, and how objects and individuals - and even texts - have been made, used, cherished, and discarded in real space over time. Judaism does not reside just in spirit or in text. It has developed, thrived, suffered and lives today in space(s). And spaces are not neutral. They influence and interact with the activities and the physical things that fill them and vice versa - what we might call a "mutual animation society". This Sunday in New York is the latest of several conferences that recognize (in the words of the great jazzman Sun Ra) that "space is the place". It all sounds interesting - wish I could be there. Sunday, March 10, 2013, 9:30 a.m.-5:00 p.m.
"The Topography of Torah: Spatial Categories in the Study of Late Antique Rabbinic Culture"
"Space, Memory, and the 'Return to the Bible' in Israeli Culture"
"A Baedeker to Buczacz: Agnon as Tour Guide"
Approach to the Cultural History of the Yishuv"
"Space and Place in Diaspora Tourism"
"Jewish Architecture and the Memory of the Holocaust"
This program is cosponsored by the Zvia Ginor Fund, The Jewish Theological Seminary, the Columbia University Institute for Israel and Jewish Studies and Prooftexts: A Journal of Jewish Literary History. Haaretz reports that in exchange, the community will yield rights to a plot of land no longer accessible due to the residential buildings and roads built on it. revealed human bones where a road was slated to be paved. Poland’s chief rabbi, Rabbi Michael Schudrich, objected to removing the remains and the issue became the subject of intense negotiations. In the end, the municipality submitted to the Jewish community and the road will be paved elsewhere. Last summer, lack of rainfall lowered the level of the Vistula River to such an extent that long-submerged objects including fragments and Jewish tombstones from the Brodno cemetery — were found. The stones were probably used to pave the river bottom after WW2. They were returned to the Brodno cemetery.